If the Beyonders are all knowing, all present combined as a race, then yes they'd be omnipotent. That's not what you said though. I've already stated, imo two or more beings can be omnipotent in unison. What love? lol I find their character development interesting. They were there before creation and helped experiment within creation. They know almost everything other then apparently "the future"
Well you cant be tricked/lied to/stolen from those are just plot devices. 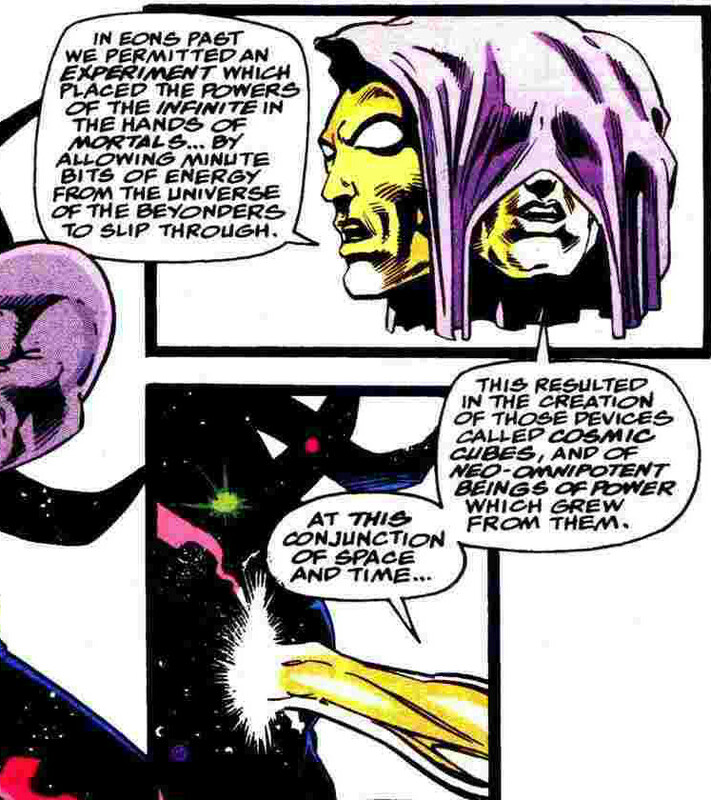 Beyonder turned off his omniscience before but was still "All-Knowing" in a deep subconscious manner. its all weird to understand even with human understanding as even tom brevoort stated it was all plot during secret wars. C'mon Beyonder. Your avatar is the Beyonder. At any point, you jump in to make sure people know he or another iteration of them are "omnipotent." You brought up the beyonders in this particular discussion. When TOAA (not the celestial ) should have been the questioned being about omnipotence in the Marvelverse. Don't shrug your shoulders with question and then go, what love, lol? Again you're not understanding. If you are not the two things, scient/present, those are not plot holes but real actual exploitable weaknesses, which questions true omnipotence. That's the point I'm making. Being there before creation doesn't make you omnipotent, neither does experimenting with creation. Why would a being that's supposedly omniscient need to experiment with anything? They should already know the result, right? Past, present and future so to speak? Wielding "unlimited power" IS the plot device because if, you aren't privy to everything to know about the creation, yes even it's future, you can't be truly omnipotent. To be honest for an omnipotent being, there really is no past/present/future/time. There just IS. P/p/f/t are points of reference for mortals to try and understand things around them. I'm arguing omnipotence as a full on concept. Without certain qualities there can't be omnipotence. In which is it possible to be tricked/lied to/stolen from? Certainly not mine. It's also possible that omnipotence/science/presence are all one in the same. I don't know how else to explain it. It's the best I can do for now. @Jabosha wrote: C'mon Beyonder. Your avatar is the Beyonder. At any point, you jump in to make sure people know he or another iteration of them are "omnipotent." You brought up the beyonders in this particular discussion. When TOAA (not the celestial ) should have been the questioned being about omnipotence in the Marvelverse. Don't shrug your shoulders with question and then go, what love, lol? Lol Yes beyonder is my favorite comic book hero but im not always on his side anything that came after Pre-retcon will get fodderized by alot of cosmic beings since beyonder was retcon and the-one-above-all was introduce i dont think we should question him as the omnipotent being of marvelverse. These are fictional characters being limited my friend michael within the lucifer series could have just wiped his brother and all creation out if he wanted to but the writer would know thats just not right even if he wields his fathers power. I mean Michael wields 2 omni powers which is Omnipotence and Omnipresence he just isn't all-knowing like lucifer is. I never claimed the beyonders were omniscient lol i stated they were "near" all-knowing but wielded just like michael infinite power and omnipresence i mean look at the plot device they were killing gods and then killing cosmic beings who were above gods but seemingly loses to doctor doom and molecule man? The-One-Above-All at anytime could have stopped the beyonders and revived the living tribunal but he knows interfering wouldn't be much since like you said he knows everything. to be a "True" Omnipotent yes you will need Omnipotence,Omniscience, and Omnipresence but in the fictional world like you said it's out human understanding of it all. Well being tricked/lied/stolen from is more or less the being lacking omniscience because with unlimited power they could easily just reverse time to not be tricked/lied to/stolen from. Omniscience is whats makes a being unable to be tricked/lied/stolen from. Both Pre-Retcon Beyonder/The-One-Above-All wants to further understand or be human but still remain to be God. The Presence/Mother of Existence wants to leave creation and see how their children do without their interference. Michael could have easily ended the war in heaven with a gesture but his conscious didn't know the outcome of what to come. Beyonder (Cosmic Cube) even with inheritable infinite power still wants to be human but by his showings he isn't all-knowing and can basically lead to his own defeat. The Beyonders were just Gods who wanted to play "The" God and wanted to see evolution/human nature and other such concepts but not being all-knowing is their reason for doing what they did. God Doom and Molecule Man even obtaining the powers of the beyonders were still not fully Omniscient but wielded Omnipotent power and didn't know much to do with it. False Omnipotence,False omniscience, and False Omnipresence is like the Infinity Gauntlet when clearly it had to many flaws and limitations to it's power and wielder. I agree 100% a FEW marvel writers shouldn't right a story on "Omnipotence" look at Jim Starlin for example in a interview the guy literally says the "Limits of Omnipotence." if their is LIMITS like LEGIT limits then said being isn't omnipotent. But i agree such a topic is very hard to grasp and very hard to discuss because we both don't know enough about it. I like these type of discussions because it could explain to some and others the many difference in views. It seems we are in agreement as far as true Omnipotence, basically or in general. Correct me if wrong here. It seems as if you're more lenient in how writers use the words they do. I notice, you put words like Omnipotence and unlimited power, into quotes. Which for you means, hey man, this is the way these guys write. What do you want from me? Is this correct? I'm of the opinion, they should find other words to describe nigh omnipotent beings. It's bad writing and it's the reason the Marvelverse is so convoluted on the cosmic scale. On the subject of omnipotence in marvel. They're so screwed up they have sentient beings creating infinite realities with their actions and TOAA only knows the alpha omega of each reality after it's created. Sorry but TOAA knows every reality that can will be created and the alpha-omega of each reality before it's created, if TOAA is truly Omnipresent/scient/potent. This is despite the fact that sentient beings barely create anything, nevermind "infinite realities." @Jabosha wrote: It seems we are in agreement as far as true Omnipotence, basically or in general. In general Yes i agree with you. Yes because some Marvel writers use the "Greek" meaning of Omnipotence which is just "Godlike or Great Power" not the definition of "Unlimited/Infinite Power"
Marvel staff did clarify beings like Galactus/The Living tribunal DO not wield infinite power but uses the greek meaning for them vs using it with beyonder which is always the English/Proper meaning which is Infinite power. Agreed plus marvel had one time called the beyonders children aka Cosmic Cubes "Neo-Omnipotent" and described them as the powers of the infinite in the hands of mortals. @Jabosha wrote: On the subject of omnipotence in marvel. They're so screwed up they have sentient beings creating infinite realities with their actions and TOAA only knows the alpha omega of each reality after it's created. Sorry but TOAA knows every reality that can will be created and the alpha-omega of each reality before it's created, if TOAA is truly Omnipresent/scient/potent. "Pre-Retcon Beyonder" aka before his reorigin was basically The-One-Above-All before The-One-Above-All was created. but After his Retcon it was then established by Marvel that infact "The-One-Above-All" is a real character and is basically the true Omnipotent being of Marvelverse. Great debate my man. Great debate. @Jabosha wrote: Great debate my man. Great debate. We should have more of these discussions. Speaking of discussion, how about we try to define what a true omnipotent being has to have/be for omnipotence? that would be a very loooooooong discussion then.